The word “contentment” is very near and dear to my heart. God has taught me quite a bit about that little word over the years, but even so, sometimes is still feels very much out of reach. Recently, I was talking with a friend about being content, and I realized that we may be looking at it in completely the wrong way. When a trial comes our way and feelings of anxiety and fear flow through us, wouldn’t we do just about anything for a little contentment in our lives? Soon we find ourselves dreaming about being “in a state of peaceful happiness” instead of the state of constant upheaval we feel in our soul. Often we make contentment our goal, but should it be? I think the danger is that we can find ways to be content that don’t include godliness. It says in I Timothy 6:6 “But godliness with contentment is great gain.” Godliness and contentment go hand in hand; a reverence for God’s character with a state of peaceful happiness. As we put our desires aside and align our hearts with God, He begins a work in us that only He can do. And we begin to realize that it’s not that our dreams don’t matter but it’s that God’s dreams are better! Does that mean that it is up us to find a way to put aside what we want and figure out a way to replace it with what He wants? NO! Our job is to simply trust. But as we trust we also need to be careful not to leave out obedience. Trusting doesn’t men that we sit back with our hands folded and wait for God to do everything for us. God gave us specific gifts, talents and desires that He has called us to. As we step out in obedience and DO these things, we will experience contentment like we never have before. When we are in the center of God’s will, actively trusting and obeying, it is like being in that peaceful spot in the center of a hurricane. Life can be raging all around us but we know that we are EXACTLY where God wants us and in that place there is perfect peace. We are completely satisfied in who God is. “The Lord is my shepherd and I shall not want.” (Ps 23: 1) We come to the place where we desire God and every other desire flows from that. 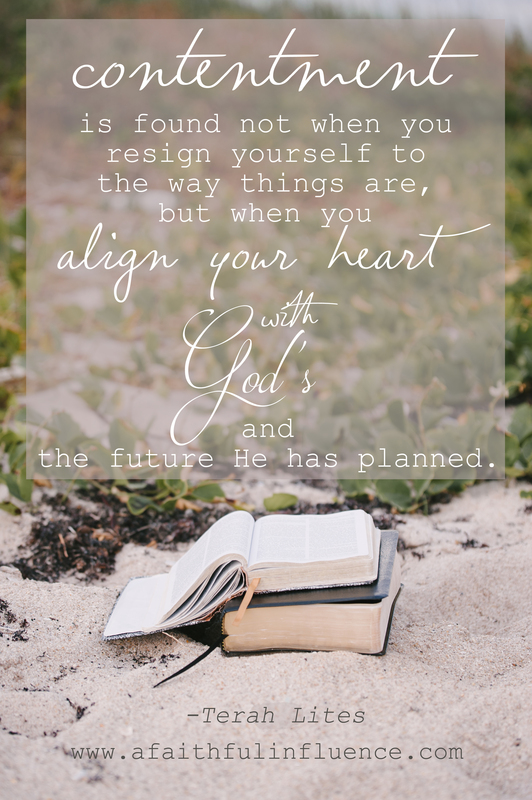 It is in this place that we realize contentment is found not when you resign yourself to the way things are, but when you align your heart with God’s and the future He has planned. In Philippians 4: 11-13 Paul states that he LEARNED how to be content in whatever circumstances he is in. He concludes that he can do all things through Him who strengthens him. I, too, am ‘learning’ this. Thank you, Terah, for your timely and true post!